For years, at least in Europe there was no such thing as organic wine. This is because while there were certifiable standards for farming grapes - or viticulture - there was no equivalent for the winery. Since early 2012 the vinification standards have been in place, which means that, in wines from Europe at least, it is now possible to purchase them organic throughout the production process. Of course standards for organic wine differ from country to country and across different certifying organisations. In the USA, in order to be sold as organic wine, there must be no added sulphur - an extreme position for most people. If you want to farm organically, then you have to adhere to a list of permitted preparations that may be used in the vineyard. Additionally for some commonly accepted materials like copper, then the amount you can use is much restricted. It takes three years of work before your land is eligible for certification. And there, right there is a contentious term. Should you certify or not? Lots of producers don't because, they say, they don't want to be known for their organic status but for the quality of their wines. But can or should you believe a grower who says she/he works to organic standards but can't prove it? Also, many people, including us, believe that it is important for producers to gain certification in order to build momentum and encourage more organic viticulture. 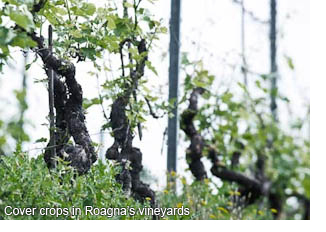 Consider - all wine is a luxury product, so why not encourage premium growing methods?